Herdez Pork Chile Verde Bowl - Cocina Mexicana - Tomatillo green sauce over tender pork and rice. 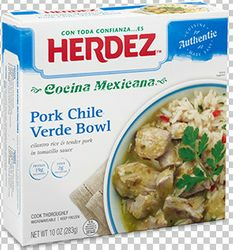 Cilantro, rice and tender pork in tomatillo sauce by Herdez new line of Cocina Mexican Bowls. A unique blend of spicy, savory and sweet. Juicy, tender pork is prepared in the traditional al pastor or �shepherd style� of cooking, using a sweet and savory sauce made from guajillo peppers, fire roasted tomatoes and ripe pineapple. Rounding out the bold flavor is a beautiful accompaniment of Spanish rice, bell peppers, corn and green peas. HERDEZ� Cocina Mexicana BowlsBring the restaurant experience home with authentic ready-to-eat meals that give you the bold Mexican taste you love in seconds. Cocina Mexicana meals have plenty of authentic flavor for the whole family. With the same quality and freshness you expect from HERDEZ� Brand, you�re savoring the best of traditional Mexican cuisine in every bite. Herdez Cocina Mexicana - authentic Mexican cuisine made easy. We only ship these products from Monday thru Wednesday so they don�t travel during weekends. Choose Ground Shipping, it will ship out Priority and you will receive it in 2-3 days in a special refrigerated packaging.